Come visit our spacious, 1920's, 2-story, 3-bedroom, log home filled with classic features, as well as a second, two-story Guest House with 2-upstairs bedrooms and main floor for billiards, ping pong and large screen TV. Note that the base price is for 8-guests. Additional guests have a nightly fee as detailed in the rates section. Bring your boat and tie up to our buoy in Dyes Inlet. In the Summer swim out to a floating raft tied to another buoy and hang out. Go paddling on the bay in one of the four kayaks (PFDs and paddles provided). The large solarium is a dream on a sunny day for serving meals or relaxing. There are three dining tables with easy access to the large kitchen that will allow for groups to enjoy meals together. A huge Weber BBQ will add to your cooking experience. Relax in the Apollo hot tub or on the waterfront patio, both with west facing views of the bay. We have added a second patio with a fireplace for you use. Send the kids to the big sports room to hang out. Play croquet in the yard. Easy access to the beach is provided by a grass ramp. In Summer/Fall go to the orchard to pick plums, apples, pear-apples, pears and grapes. Kayak in the bay. The main house has three spacious, upstairs bedrooms with four queen beds, a futon and room for cribs. Each room has a comfy chair looking out on the water for personal reading time. The second building (the Guest House) has two upstairs bedrooms with one room having a queen bed and the second room having two queen beds and a sectional couch. The entrance to the second building is about 100 feet from the front door of the main house. Enjoy wifi and satellite TV in both buildings. The main house TV and Vizio sound system allow you to connect your phone via bluetooth to play your music. Wireless internet and Direct TV will take care of your connection and media needs. The living room is the show piece of the house and will be a great place to spend time. The main house has a 3/4 bath downstairs and a full bath upstairs. The full bath has a claw foot tub to relax in with a hand held shower, head rest pillow and teak reading tray making for a nice soaking experience. The second building has a full bath downstairs. Erlands Point is ten minutes from the Bremerton Ferry terminal, Traders Joes, Costco and Safeway. There are great golf courses in the area and easy access to Hood Canal and the Olympic Mountains. Take the car ferry or faster, foot ferry to Seattle in under an hour. Gig Harbor, Poulsbo, Bainbridge Island and Pt. Townsend are all less than an hour away. After enjoying 12-years of sharing our first waterfront rental in nearby Allyn (#108511) we decided to open this fun property for others to enjoy. FYI the driveway is shared by another home. Plenty of paved parking is available. Note: The daily rate is for a maximum of 8-guests. A $30 fee/day applies to each additional guest up to the maximum of 14. 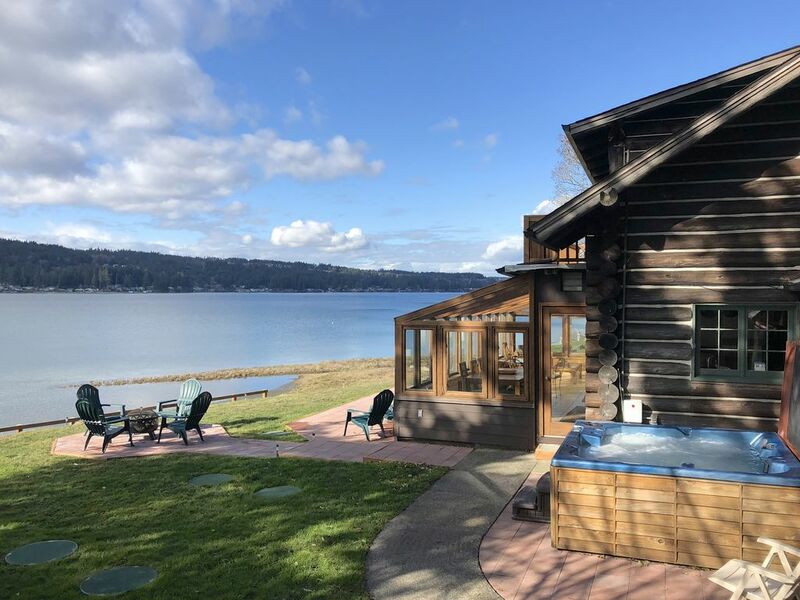 This 1920's log home has great appeal with it's solarium, hot tub, incredible living room, water views, 2nd building with huge sports room and spacious bedrooms. It provides space to gather as well as spots to quietly read a book or talk with water views to enjoy. The three dining tables allow for plenty of seating for adults and children. The water in Dyes Inlet is perfect for water sports. There is a lot to love and enjoy at this home. Waterfront, water sports, multiple gathering areas, multiple dining tables, beautiful "Great Room", separate sleeping area, separate, huge sports room, large lot, beautiful view, sunny western exposure in afternoon, big kitchen, hot tub, solarium. There is a portable air conditioner for use in the three upstairs bedrooms in the Main House. There is a window air conditioner for the bedrooms in the Guest House. There are many fans avaialble too. Plenty of parking in the paved driveway and in the gravel at the front of the property. There are 3-dining tables. The table in the solarium may be unusable in the cooler months as there is no heat source other than the sun. The game room has a heated floor. There are no steps into either building, but there are no bedrooms on the main floors. We have a collapsible indoor dog kennel for a large dog. We have two "toddler" gates to block off doors. High chair available on request. The house was perfect for our stay and the weather was phenomenal! The layout of the two structures worked very well for our situation. This would be a great place to rent for a large family gathering. Loved the game room! Awesome view. dang weather but plenty comfy for our group. Dave was very attentive. We enjoyed our visit greatly! Thanks for visiting during one of the biggest snow storms the Pacific Northwest has ever had! It was epic! Perfect house for groups. Great host. Plenty of room for our big group in this bis home, the "poolroom" was great for overflow and for those who wanted to get to bed a little earlier. We learned how to collect mussels and clams and cooked them over the fire outside! Highlight of the trip. Dave was very helpful and quickly responsive to any questions we had, and went out of his way to make sure we had everything we needed for our stay. Charming! Owner very responsive to our needs. Fine house, good location. Beware of highway noise. Beds were cozy; loved the flannel sheets. Plenty of towels. Appreciated the use of non-toxic laundry products! Kitchen was very well supplied with nice service and glass ware. And the blender actually worked! Although I had to thoroughly scrub it out first. We didn’t spend much time outside, but the yard was well maintained. The neighbor houses are very closeby. The bunkhouse with game room provided the extra beds we needed and a few games of ping pong. That second kitchen was bare, except for a fridge. The owner is friendly and very responsive. Would recommend for your next family gathering! Wonderful place for a family gathering. We spent three days here between Chrismas and New Year and our large group were all comfortable and happy! All of the communication leading up to our stay was prompt and instructions were straightforward. There was plenty of space both to gather together and to spread out between the two houses. Every need was provided for. We particularly appreciated plenty of dishware & cutlery, sharp knives in the kitchen, cozy throw blankets to curl up in all around, plenty of towels and of course the view from the solarium. I'd definitely recommend. The only annoyances we had were the filtered water from the fridge running exceptionally slowly - maybe a new filter is in order or need to clear out the lines? and the kitchen faucet needs to be replaced - doesn't stay on with low pressure and sprays everywhere! with high pressure. The place seems generally well cared for and the owner very attentive so I'm sure these issues could be addressed. We are glad that you had a great stay! The faucet valve has been replaced. Thanks for mentioning the frig water is coming out slowly. We will replace that filter.